The two powers have moved in unison against the UN resolution on Syria, but behind the facade their rivalry in energy and military might grows. Moscow (AsiaNews) - At the UN, as was the case with Libya, China and Russia moved in unison, but their veto on the draft UN resolution against Syria is only an apparent alliance. Behind what many analysts see as a facade, there is a growing rivalry. "Despite similar diplomatic positions in fora like the UN Security Council, the two countries lack mutual trust and cooperate only when their interests converge," said Linda Jakobson, a collaborator of the International Peace Research Institute (SIPRI) in Stockholm, which monitors the global arms trade. The rivalry between the two neighboring powers, according to SIPRI, is apparent in the military and energy fields. In a recently published study, the Swedish Institute explains how the success of China in diversifying energy supplies and military cooperation have undermined a decades old alliance. 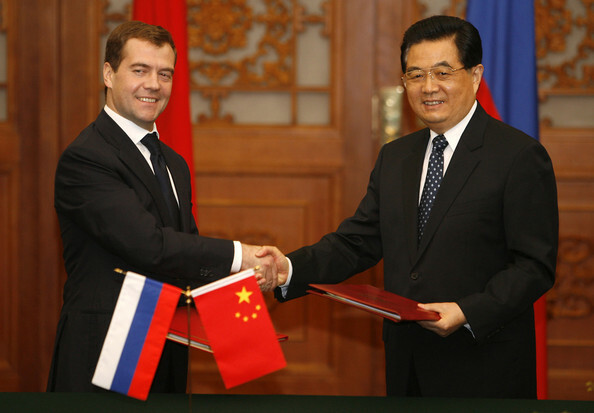 Beijing is increasingly dependent of Moscow, which now looks at the dragon as a veiled threat. "Diplomatic relations remain good, but the key points of collaboration in recent decades - weapons and energy – are deteriorating," says the document. And "Russian influence on China will continue to decline." Beijing once relied on Moscow for arms, but now its progress in the defence industry has transformed it from buyer into competitor. For its part, the Kremlin does not trust its neighbour enough to share its know-how in advanced technology, for which Beijing is rather thirsty.